Plykea, a new U.K.-based startup, offers beautifully made, reasonably priced fronts and worktops for standard IKEA kitchens. Launched last month by Tim Diacon, a digital product designer, and furniture designer Adam Vergette, Plykea designs plywood doors, drawer fronts, worktops and cover panels for IKEA cabinets. The idea came about when Diacon was renovating his house and looking for a way to build a beautiful kitchen on a limited budget. 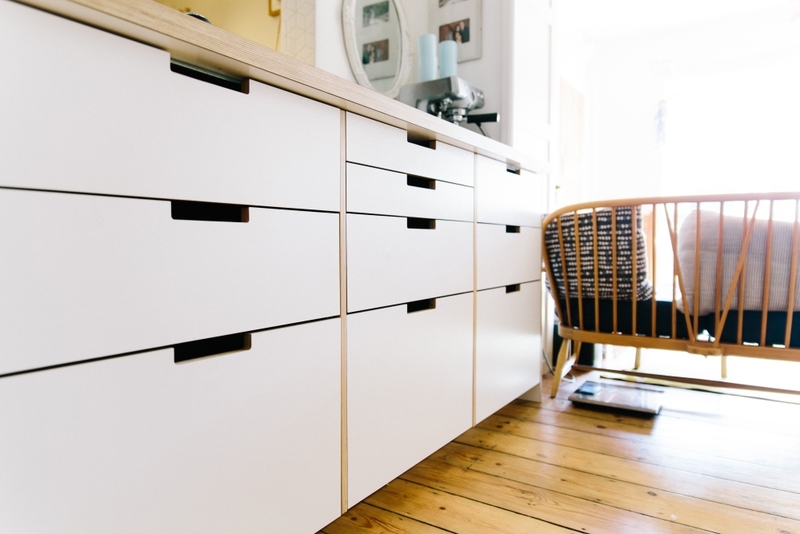 He had previously installed an IKEA kitchen but loved the look of birch ply, so searched online for a company that could make a set of bespoke fronts. Unable to find an option with the right choice of materials or reasonable pricing, Diacon turned to his friend Vergette. After completing Diacon’s kitchen, they decided to combine their skills for the new online service. Adding Plykea’s fronts and worktops to IKEA’s ‘Metod’ base cabinets creates the look of a bespoke handmade ply kitchen for a fraction of the cost. Plykea cuts each item using the latest CNC machinery to ensure it fits perfectly. Then surfaces are hand-finished by sanding and the application of several coats of wax oil, which is durable and water-resistant. The doors, drawer fronts and cover panels, constructed from FSC certified plywood, are available in wood-faced ply (which can be birch, oak or walnut) and formica-faced ply in different colors. There are three handle options to choose from: a grab handle, circle handle or brass pull. Plykea also offers spacer panels, which can be fixed between IKEA cabinets, and formica worktops.